Lindsay, G. and Morhayim, L. (Eds.). (2015). 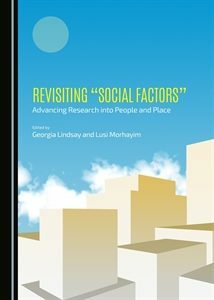 Revisiting “Social Factors”: Advancing Research into People and Place. Newcastle upon Tyne, UK: Cambridge Scholars Publishing. ISBN: 978-1-4438-7734-3. In Revisiting Social Factors, Georgia Lindsay and Lusi Morhayim take on an ambitious set of questions both reflective and forward-looking: What is the status of social and behavioral research in environmental design? How can the rich, fifty-year history of Social Factors continue to shape, for the better, the places we design and inhabit and inform scholarship at the intersection of culture, space, and place? We begin in Berkeley, California, where the first Social Factors program in an Architecture department began in the 1960s and where, in 2011, a conference entitled “The Death and Life of ‘Social Factors’: A Conference Reexamining Behavioral and Cultural Research in Environmental Design” convened to investigate the state of “research regarding the relationship between culture, individuals, and the built environment.” As a young Social Factors scholar at Berkeley, the “d” word—death—haunted me: how could Social Factors be dead? Undoubtedly, the field has undergone substantial change since its 1960s heyday, and, in some ways, is marked by the patina of time: neither the behaviorist origins nor the language we use to talk about Social Factors is adequate for today’s research and practice agenda. Yet this book, born from the papers presented at the “Death and Life of ‘Social Factors’” conference, testifies to the long and still robust life of the field. Echoing Jane Jacobs, who both acknowledged the lifelessness of ‘renewed’ urban space to contrast (and attempt to preserve) the promise and joy inherent in historic, diverse city life, the chapters that follow do not chronicle or foretell the death of Social Factors, but rather celebrate its life, then and now. In fact, as Galen Cranz argues in the Foreword to this book, a social perspective reaches farther into architectural education, scholarship, and practice today than ever before: the National Architectural Accrediting Board requires that all students engage in courses that expose them to social and cultural concerns, the rise of interest in architecture for the public good demonstrates a profound appreciation for contextually sensitive design, and, according to Cranz, “approximately half of the research in building science entails social variables” like comfort and use. Further, the eight essays that comprise this book show how the previous accomplishments of the field and the innovative, interdisciplinary work being done by researchers and practitioners regarding people and their spaces continue to reverberate—and make significant contributions to architectural theory and practice—today. Though rooted in its Berkeley origins, Revisiting Social Factors boasts broad appeal in the breadth of subject matter it takes on. The book, divided into two sections, begins with a series of essays that orient the reader to the linguistic, historic, and methodological underpinnings of Social Factors and chart a course for future scholarship. In “The Words We Choose,” Karen Franck explores how the language we use to talk about Social Factors research can obscure the value, scope, and disciplinary edges of this field. For example, though “tremendously inclusive,” the terms environment and behavior tend to atomize and stagnate concepts and, in so doing, belie the complex co-influence of people and their places. Instead, we might say space and use—as in the social use of space—or choose other words that convey something multiple, relational, dynamic, and, yes, alive. Similarly bridging past and present, Dominic Fisher investigates whether the findings of William H. Whyte’s seminal 1971 study of New York City’s small urban spaces remain true today. In a comparative study of two parks—Paley Park, the darling of Whyte’s study, and its predecessor, Harlem’s Collyer Brothers Park—Fisher demonstrates how contextual factors shape the success of a park (Paley) or its neglect (Collyer). Ultimately, he concludes that, in today’s changing urban fabric, Whyte’s praise of small urban spaces as “multipliers” of activity “is still invaluable, but cannot be applied verbatim to seemingly similar spaces in communities underserved by healthy streets and opportunities.” Fisher’s work demonstrates how a contemporary approach to Social Factors research can—and should—continue to inform urban design practices. If Part 1’s orientation to Social Factors suggests a modern approach to long-standing questions in the field, Part 2 makes good on this promise by showcasing people doing social factors research in both academic and professional settings. Comprised of five studies “that assume the user perspective, with human responses and needs as the unit of measurement,” Part 2 conveys how Social Factors is uniquely poised to address some of the most pressing concerns of our time. Designing for people with disabilities has long been an interest of socially-minded architects. Yet Ann Heylighten challenges normative approaches to designing for disabled bodies by focusing not on positivist universal design standards, but rather on how people with a range of disabilities—lack of sightedness, hearing deficiencies, and autism—experience built settings in unique ways; such insights can inform new understandings about both definitions of disability (which she defines relationally in the context of person-environment fit, rather than as an inherent individual condition) and spatial experience more broadly. Programmer Emily Golembewski similarly urges the reader away from a normative practice, this time of programming, a distinct discipline from design, though equally integral in ensuring person-environment fit. Informed by her work at Francis Duffy’s innovative office programming firm, DEGW (now AECOM), Golembiewski offers a toolkit for programming methods: she introduces readers to the strengths and limitations of “formulaic” and “messy” approaches to user research, with the ultimate goal to “identify needs and project drivers, which may be organizational, financial, functional, or cultural in nature.” Though Golembewski’s audience ostensibly is professional programmers and designers whom she hopes will integrate user research into architectural practice, she also makes a compelling plea for architectural educators to “explore the (sometimes tense) relationship between programming and design,” in order to achieve the best possible design outcome. Marie-Alice L’Hereux also considers the role of education in Social Factors work, particularly regarding sustainability. L’Hereux sees sustainability through a decidedly social lens: “aesthetics, behavior, and technology,” she argues, “all need to be engaged for projects to be successful from both a community and a climate change perspective.” Translation: to be sustainable, buildings must be designed for human use and must perform socially as much as environmentally. Yet L’Hereux demonstrates how easy it can be to neglect social needs when residents are not consulted as part of the design process and social factors are not an explicit part of the curriculum or design criteria. For example, students in a Design-Build Studio focusing on sustainable affordable housing ignored “the fine-grained features of daily life and…maintenance and utility costs,” such that, in the end, according to one student builder, “we did not really design a house that people would live in…it had a neat effect, made good pictures” but did not meet the needs of clients. This chapter reinforces the importance and role of social factors as a primary tenet not just of sustainable design, but of design itself. A chapter by Yael Perez and colleagues complements that of L’Hereux by offering digital and methodological tools to design sustainably with people; in other words, to engage in co-design to create sustainable housing. Reflecting on their work with the Pinoleville Pomo Nation (PPN), a Native American Nation near Berkeley, CA, Perez and colleagues demonstrate the power of co-design to support a sustainable design approach. Additionally, they show how social media technologies—including Facebook, email, blogs, Google Maps, YouTube videos, and Twitter— can facilitate dialogue among participants and designers in order to articulate how architecture is experienced and—ultimately—design buildings that celebrate community needs. Such an understanding of people-place interactions—and their translation to meaningful policies and practices—is one of the important legacies of the Social Factors field. A contemporary example of this comes from Cecilia Bodelmann and a team of colleagues from the United States and Sweden. Recognizing two parallel shifts—the rise of sedentary behavior among children and the expansion of preschooling—Bodelmann and colleagues studied the health promotion potential of preschool outdoor environments. After scoring a range of environments based on factors such as size and integration of vegetation and play areas, the authors found that resource-rich environments correlated with increased levels of physical activity among preschool-aged children. This study has clear implications for policy and design practice, especially regarding the need to create healthy learning environments for young people as a means to combat deleterious impacts of sedentary behavior. It also is an inspiring model for how interdisciplinary collaboration can fruitfully address person-environment concerns. This book began with a lofty promise: to show how questions and research regarding people and place are very much alive today. Though the case studies included are limited in breadth, as is the nature of case studies, they prove nevertheless that the basic priorities of Social Factors serve a vibrant and important role in education, research, and practice today. Indeed, though difficult to convey in just a few chapters the full depth—or potential—of the social factors field, the “cross-section” approach employed by Lindsay and Morhayim successfully uncovers the range of questions alive in person-environment studies as well as the many voices—emerging and seasoned scholars, different disciplines, local and international perspectives—they engage therein. Importantly, this text is not simply for those of us already familiar with, drawn to, or invested in revisiting Social Factors: in fact, it can inform research and practice in other fields as well. First, it offers an agile framework for thinking about and designing for the intersections of people and place, a topic of interest to geographers, historians, and public health researchers, to name just a few. Second, its authors collectively call for reform in design education—a timely topic as we consider the challenges of designing in a world defined by increasing diversity and complexity—and offer case studies that would be at home in many (interdisciplinary) course syllabi. Finally, this book is edifying reading for designers of all types: a reminder of the value of the social perspective and a toolkit for how to think about and design for the social use of space.